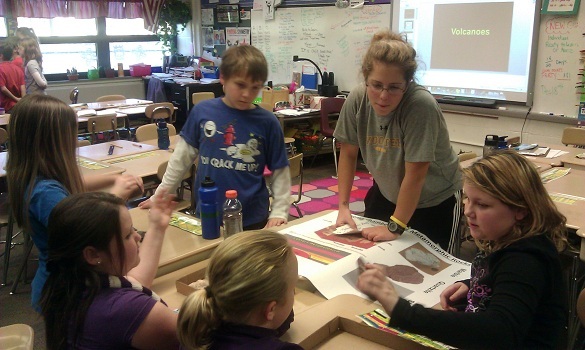 WOOSTER, OHIO — A “Volcano Team” headed to Melrose Elementary this week for an afternoon of fun with Marge Forbush’s 4th grade class. It was our annual fall trip to her classroom, and our task was to discuss the various geologic processes associated with volcanoes. The 4th grade students had already studied plate tectonics and volcanoes, so they were experts on the volcabulary, such as “Ring of Fire”, “magma chamber”, and “Pompeii”. Before Thanksgiving, they had even built active volcanoes in the classroom. Lauren Vargo (’13) is a Wooster veteran of community outreach, having gone with both Greg Wiles and myself to several elementary schools in Wooster (Cornerstone, Melrose, and formerly Wayne). She was in charge of discussing the impact of contact metamorphism with the students, and she had numerous metamorphic rocks on hand. Matt Peppers (’13) seemed to field some of the most unusual questions of the day. Here he is showing the 4th graders several different types of intrusive igneous rocks, along with the minerals in each rock. Some of the students in Matt’s group are destined to become geologists, because they already could identify the minerals from their own “rock collections” at home. 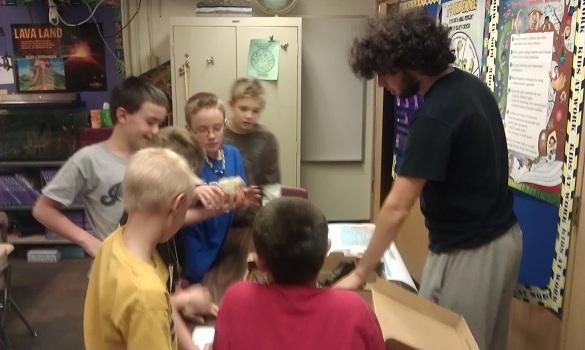 Adam Silverstein (’16) was in charge of one of the more fun stations: volcanic bombs!! He used some of his knowledge from Meagen Pollock’s Natural Hazards course in order to talk to the students about hazards during a volcanic eruption. As you can imagine, everyone liked to pick up the volcanic bombs, some of which were collected in the Black Rock Desert, Utah. 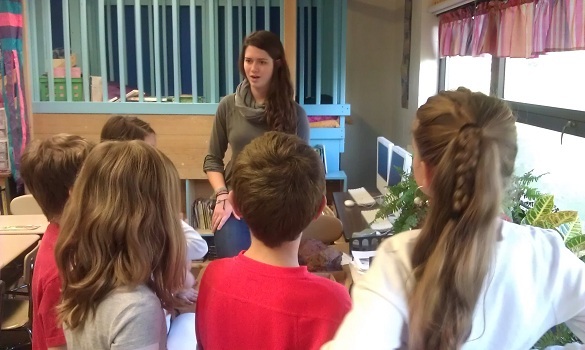 Another member of Wooster’s Natural Hazards course, Kaitlin Starr (’16), was a welcomed volunteer and an old friend. Kaitlin, who was in charge of the lava flow station, is a Wooster native. Kaitlin was actually a student of Marge Forbush when she was in the 4th grade, and so she received a round of applause from the students for coming back and visiting her old classroom. 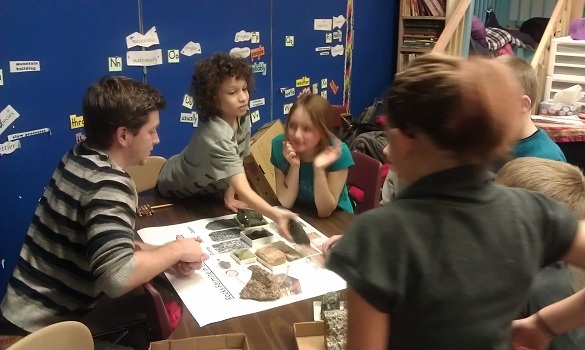 We’ll be back to visit Marge’s classroom again in the spring, but next time our focus will be on fossils. Stay tuned! !